timing/angle information. The other 6 are high speed direct PLS outputs. The PLC microprocessor accepts 16 external inputs and 10 internal inputs from PLS, and performs programmed logic to control a total of 16 outputs. 12 are normal PLC relay outputs and 4 may be used too logically and the 4 direct PLS outputs. The PLC microprocessor supports most commonly used relay, timer and counter instructions. Another microprocessor takes care of the operator interface. It controls display, keypad and exchanges information with PLS and PLC processors. Unlike most PLC’s, the operator interface is integrated with the unit, and allows monitoring PLC variables such as bit status, timer/counter values and helps in debugging the program by forcing the I/O on or off. The machine can be fine-tuned while running using the operator interface. Simple operator interface, using bright red LED display makes programming. Fine tuning, debugging and monitoring of the machine a breeze. The operator interface has a key to switch between PLS and PLC and uses AVG-Autotech’s very popular 5 keys to do the programming and monitoring. The unit shows prompts for user to enter appropriate values and cursor position shows which value will change in response to INC/DEC keys. Implement batch counters, parts counter or any desired counter or timer function in ladder logic using 80 timers and 46 counters supported by the PC.PLS and then use the interface to view counter/timer values. This unit performs brake monitoring function and will display the press stop time. In order to prevent nuisance Motion Detection faults, a user adjustable time delay should be set to allow the machine to engage prior to enabling the Motion Detection feature. An additional advantage of the M1500 is that you can fine-tune your limit settings while the machine is running. The increase in machine productivity pays for the PLS within months. The ON/OFF set-points for each output can be programmed simply by the touch of a key from the front panel. The Autotech patented key sequence in the M1500 is incredibly simple and easy to use. In the Tach mode the M1500 displays the press speed in SPM. Unlike an electromechanical limit switch that requires periodic maintenance and is often mounted at places that are hard to reach, the M1500 requires no maintenance and has no mechanical cam/contacts to wear out. In addition the plug in output relays are easily field replaceable. 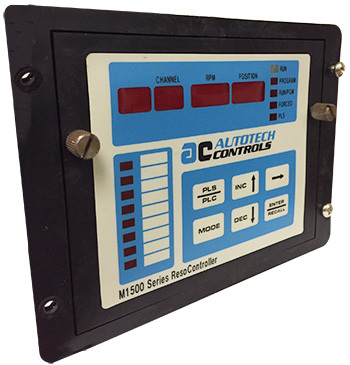 The M1500 allows 2 levels of security, through the use of a programming enable electrical inputs, to prevent unauthorized programming changes.